The interior of the restaurant has an interesting piece of art which looks like something edible. Looking at the menu, the prices aren’t cheap and we didn’t want to spend too much for lunch, so we decided on the set lunch (SGD$28++), which comprised of three courses. Before our food arrived, we were given 4 types of sauces/accompaniments to go with our dishes. Clockwise from Top Left: Ginger slivers in vinegar, chilli sauce, XO scallop sauce and a truffle infused minced garlic paste. No instructions were given as to pair them with which dishes, so I guess we had to get creative ourselves. The first course was a choice between Hot Explosion XLB (Whisky Pork or Truffle Cheese Chicken) or Whimsical Buns (Liquid Egg or Minced Vegetables). Surprisingly the combination of truffle, cheese and chicken worked in the XLB and it was tasty! The Liquid Egg Whimsical Bun on the other hand, tasted like the liu sha baos that can be found at other restaurants. The second course was a choice between two different noodle dishes and we ordered one of each. Corn Noodles (Sous Vide Chicken, Peanut Broth) – my hubby liked it but I thought it tasted a bit on the light side. BlackRed Duple Noodles (Braised Beef, Fried Mushroom Stems) – the soup was quite tasty but the visually striking noodles were a little limp in texture. The third and final course was of course dessert and we were given a choice of Tiramisu, Chocolate Praline Cake or a Selection of Mochi. We chose the first two as I’m not really a fan of mochi. Tiramisu (Mascarpone, Coffee Sponge, Expresso Ice Cream) – the flavours were true to how we expect the dessert to taste, but probably a bit stronger than the ones that you’ll find elsewhere. Chocolate Praline Cake (Poprocks, Vanilla) – very chocolatey cake which seemed to have been soaked in some alcohol. The peanut butter was smooth and cleverly hid a fair quantity of pop rocks. Everything on the plate amazingly worked well together, with the pop rocks giving a pleasant surprise in your mouth! Overall, I felt that the desserts fared a notch better than the food. I’d probably come back again to try their high tea which has some dim sum items but more desserts. On the other side of the restaurant is a sweets boutique, where you can find many interesting and colourful creations! All of them look too pretty to be eaten! I like the ones that look like Lego bricks! Address: 93 Stamford Road, National Museum Singapore, 01-06, Singapore 178897. The restaurant has a simple and elegant, yet cozy setting. 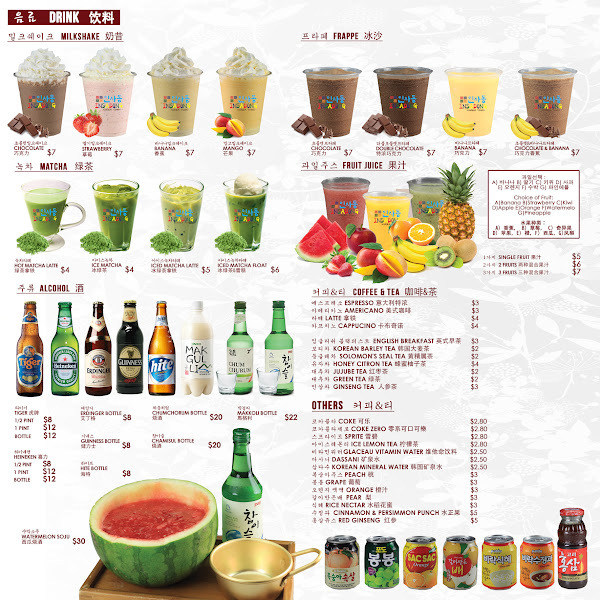 Interestingly, the food menu spans two pages but the alcoholic list spans 3+ pages!! 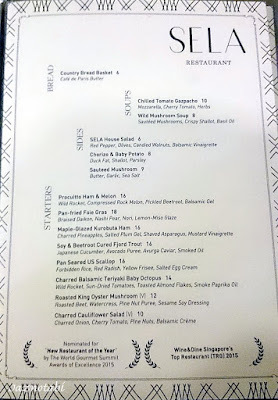 The offerings on the new menu are a marriage between Modern European and Asian cuisines. Before the meal was served, there was a bottle of liquor sitting on the table and labelled with the words “HONEY & PEPPER”. I’ve never seen this before and it turned out to be a bottle of Ukrainian Vodka (40% alcohol) and we were asked to drink it. @alvinology jokingly said that @littlemisshoney will definitely drink it cos her name is Honey! LOL! Gosh…the first whiff of the vodka was already intoxicating! When you take a small sip, you can taste the sweetness of honey, as well as a spiciness from the pepper! Its aftertaste leaves a tingling sensation on your tongue. Hmm…potent stuff!! The fish is marinated for 3 days, resulting in this beautifully flavoured dish! I usually don’t fancy seabass but this version somehow reminded me of eating cod and I was surprised that I actually liked it! This was extremely tender and flavourful and tasted almost like beef, but it was unmistakably pork! Cooking takes 6 hours and the meat is braised at 150 degrees in a combi oven and kept in its own juices to retain its flavours. Yummy! The texture of the cake was a little grainy, as expected from semolina, but it paired well with the flavours from the other ingredients. I shared this dessert with @dessertingbeauty and another blogger and we divided it into 3 parts (sorry, no “after” pictures as it was quite messy!). The pavlova was a nice crunchy meringue and I liked the dehydrated chewy pieces of pineapple, which not only had a nice colour, but also had some sweetness like the pineapple jam found on pineapple tarts! The ice cream was made from their in-house recipe using vanilla bean extract and it was smooth and creamy. What gave this dessert an additional kick was the paprika powder! I couldn’t taste it initially but the aftertaste suddenly hits you with a tinge of spiciness! Apart from the restaurant’s standard menu, a 3-Course Executive Lunch is available on weekdays at $15.90+ (menu changes every 2 weeks). 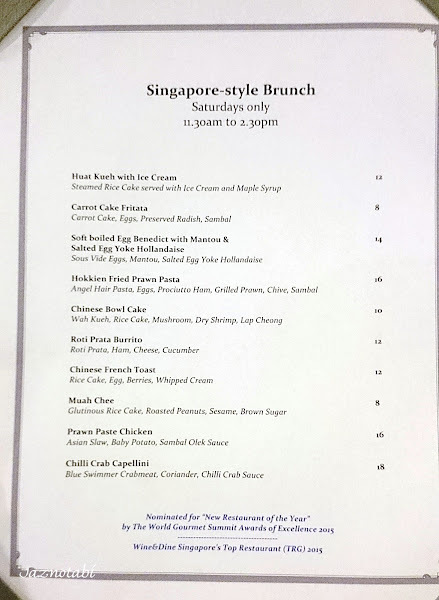 A Singapore-Style Brunch menu is also available but only on Saturdays. Chef Benson is quite well-known in the industry and he is a celebrity chef who revamps restaurants, provides consultancy services to restaurants and is also a private chef. He has cooked for many famous people (who cannot be named) and we heard that one of his clients residing in Singapore is one of the co-founders of a well-known social media network! Chef Benson is running a contest for one lucky person to win a private chef meal in your own home (worth $500)! All you have to do is to dine at Restaurant Sela, post a picture of your meal on Instagram, hashtag #selarestaurant and tag @restaurant_sela and @jaznotabi in your photo. Hurry…this contest ends on 31st August 2015! Good luck!! 32 Seah Street, Singapore 188388. 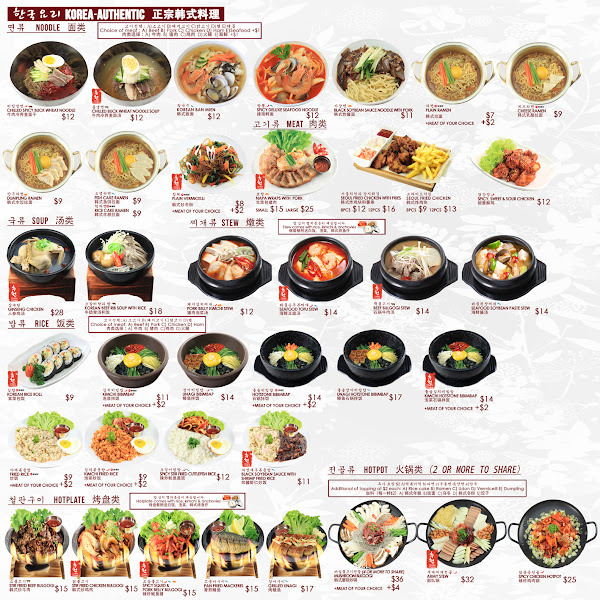 After my previous review, Insadong Korea Town shut its doors for further renovations and re-opened this month with changes to their menu and a new self-service ordering system! 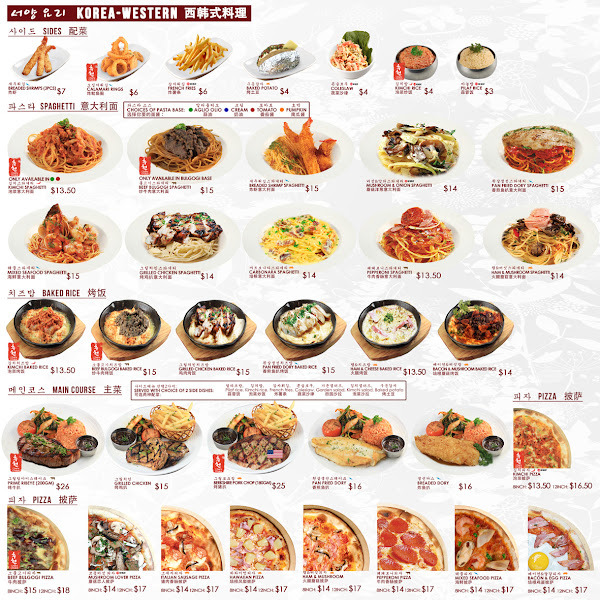 Opened by the MOF group, this themed dining experience now offers a wider variety of food, ranging from Authentic Korean dishes, Korean-Chinese, Korean-Japanese to Korean-Western! 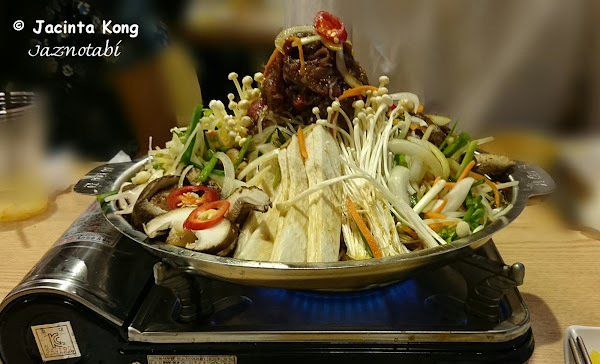 When this place first started operations in September, it served only Authentic Korean dishes and the concept wasn’t popular with the locals, thus their main clientele were Koreans, but with this re-launch and a re-vamp of their menu, there’s something to suit everyone’s taste buds and business is booming now! Hmm…noticed that the side entrances are now accessible (previously you could only enter from the front)! My previous visit (and review) was out of my own pocket and I didn’t manage to try that many dishes before they closed for further renovations, but this time during the soft launch of their re-opening, I was invited by MOF for a food tasting session and there were 14 items on the tasting menu (including drinks and desserts)!! Lena Sim, the CEO of MOF, took us on a short tour of the place and I must say that throughout the entire evening, I could feel her passion for her food business and her enthusiasm for all the new dishes at this latest Korean-themed eating establishment! She has a good business sense and I was really impressed! Self-service order kiosks can be found at the main entrance of the restaurant. 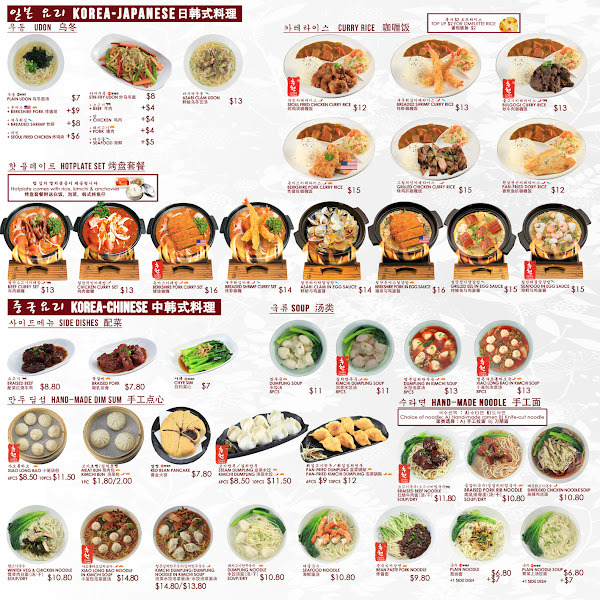 It’s quite simple to place an order on their touchscreen interface – just click on the various tabs to view the available items on the menu and select the dishes that whet your appetite. At the moment, only cash is accepted at these machines (change will be given). If you need to pay by NETS or credit card, you can do so at the cashier counter. You can also enquire with them on the earning/redemption of RWS Invites points. 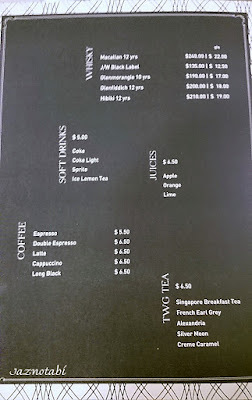 I noticed that the little cafe at the front, which previously sold only drinks, has been transformed and it now sells both drinks and desserts! 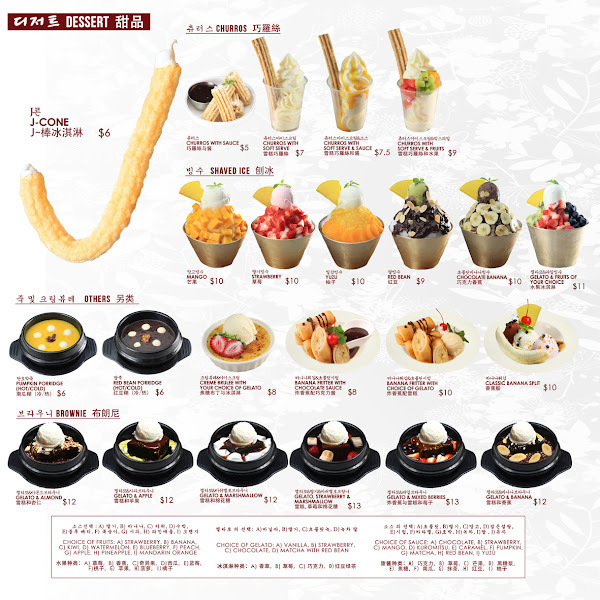 Do note that there is a separate queue for the J-Cone dessert (from the main entrance to the cafe) and this is for customers who are not dining in and just want to buy the dessert, so they can just pay at the cashier counter there. Back in September, they had used a system which had numbers flashing on TV screens to inform diners to collect their food, but now buzzer devices have been introduced and these will go off when your food orders are ready. There’s even a sign showing you the locations of where your food orders can be collected from (depending on which category of food you have ordered and I guess the respective location will be printed on the receipt)! …and Kiosks 1 and 2 are located in the middle of the dining area. Korean Street Food was being prepared at Kiosk 1 and I went to have a closer look! …and there’s also meat buns and spicy Korean rice cake! …and even Roast Suckling Pig is available!! I don’t really like kimchi but this was good and I even had a second helping!! 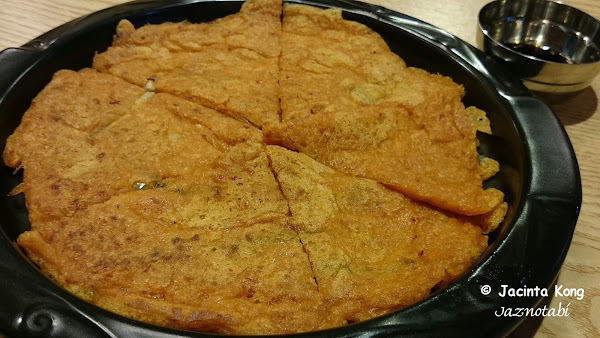 The pancake was slightly chewy and it had a vegetable filling (kimchi obviously! ), which wasn’t as sour as the usual pickled version. Apparently this dish is extremely popular with Indian diners too! A must try! 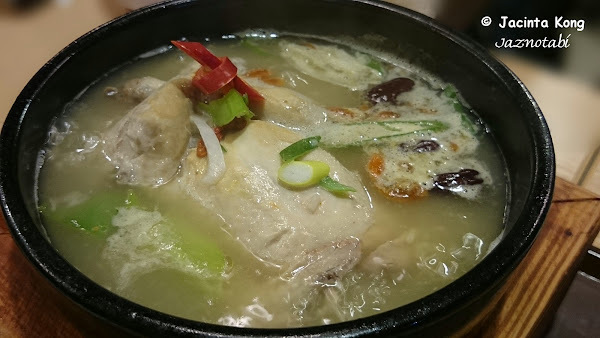 This is definitely authentic Korean ginseng chicken soup as the chicken is stuffed with glutinous rice and the soup is rather light tasting due to Korean ginseng not having a strong flavour. One thing I did like about the one here was that the stuffing in the chicken had chestnuts mixed in with the glutinous rice – the famous one that I had tried in Seoul, Korea had LOTS of garlic in it and I didn’t enjoy that one! The main highlight of this dish is the pork belly (similar to Chinese roasted pork belly – 烧肉) and the meat is served with accompanying ingredients like slices of garlic, kimchi, green chilli and a fermented bean sauce (like miso paste). To eat this, wrap the meat and the accompanying ingredients in the lettuce leaves that are provided with this dish. Wow…the portion isn’t small and is packed with a mountainful of ingredients! We were introduced to Chef Emily Oh, who was the one who had prepared all the dishes and we had the privilege of having her help us with the cooking of the ingredients in the hotpot at our table. 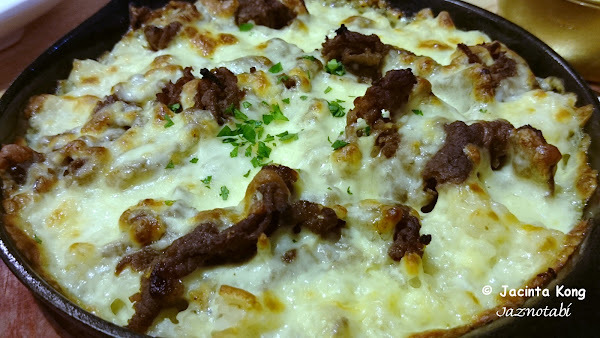 This baked rice dish has a cheesy topping and a decent amount of beef in it. It was tasty on its own but we were told to eat half of it and reserve the other half for another method of enjoying this dish! If you remember the Mushroom Beef Bulgogi Hotpot mentioned earlier and if you order both the hotpot and this baked rice, you can put a portion of the rice into the hotpot and let it soak up the flavourful soup stock – it certainly gives the dish a different dimension of flavours and was surprisingly delicious! LOVED this pasta dish!! The sauce had a smooth creamy texture with a rich buttery flavour and seemed to be made with pumpkin, which had been pureed. There were also bits of ham/bacon in it. Somehow I couldn’t find this dish on the menu and the only item with the same look and colour of the food which resembled this was the Carbonara Spaghetti ($14)! This to me is a Chinese dish! I didn’t know that it is considered a Korean dish too! It was quite nice – the dumpling skin had just the right thickness and contained enough soup to fill my spoon. This tastes very much like Chinese-style red bean pancake! Apparently it is a Korean dish too! This probably is the most popular dessert here but I feel it’s more of a novelty. 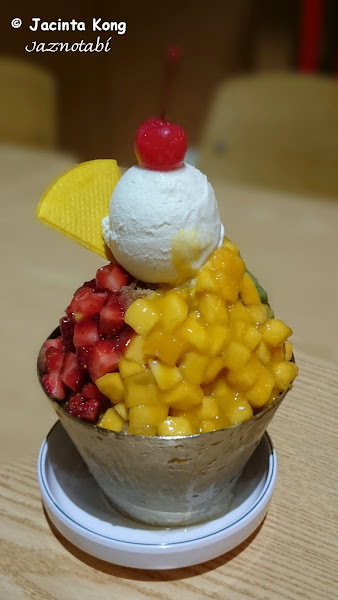 Typically known as jipangyi in Korea, this cane-shaped thingy is a puffed corn snack which has a hollow centre and vanilla ice cream is pumped into it. MOF specially brought in a machine from Korea and they make these J-cones in their local factory. A word of advice – you’d better eat them quickly before the ice cream starts to seep through! I found the ice cream leaking through the base of the “J” after some time!! This was very refreshing drink and is something that I would usually order if I have a cold or sore throat. 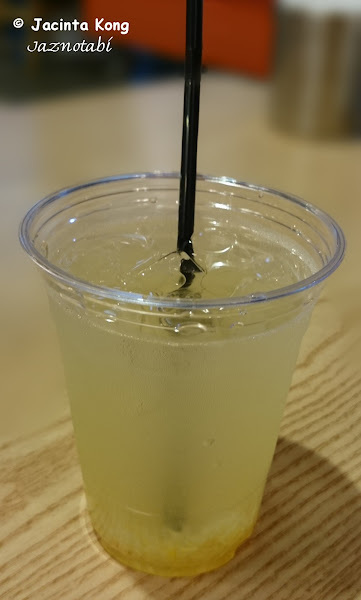 If you like this drink, you can actually purchase a bottle of the honey citron mixture (available here at $15.80 per bottle) and make this drink at home. Now, this was a very interesting drink as I’ve never had it before! I mean I have drunk soju but never in a watermelon concoction! 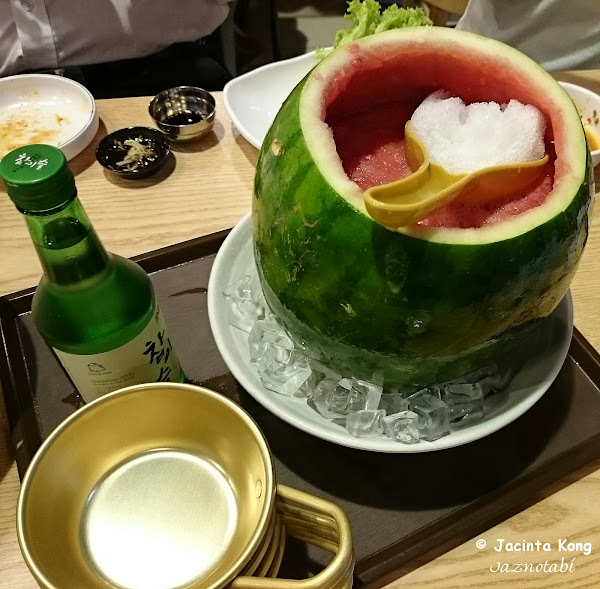 A whole bottle of soju is poured into the watermelon juice, which then turns this into an alcoholic beverage but in fact the alcohol content is really diluted after being mixed with the juice from a whole watermelon! It was refreshing but won’t cause you to be intoxicated even if you’ve had 2-3 cups of it. The new re-vamped menu has a lot more variety of food being offered but my favourite grilled galbi dish was nowhere to be found! Arrgghh! !…I do hope they will put it back on the menu! However, I was quite thankful for this tasting session as it allowed me to sample some dishes which I would have never imagined myself ordering and I have to say that most of the dishes that we had tried were pretty awesome! 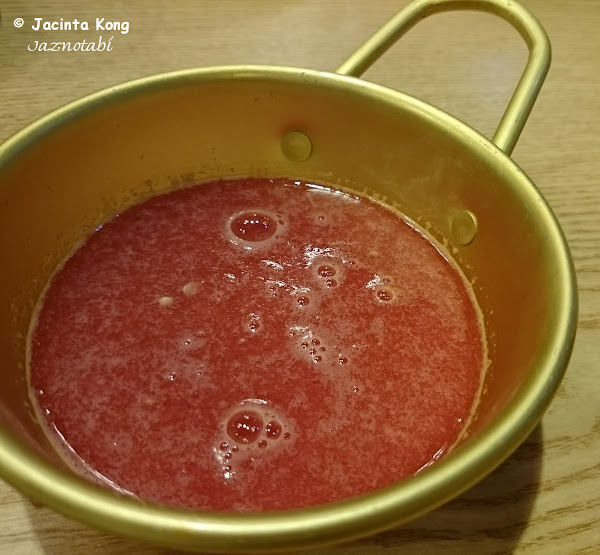 I liked the fact that the chef insisted that the recipes were kept true to the authentic Korean taste, but she compromised by allowing additional sauces to be provided with certain dishes to cater to the local taste buds (e.g. milk with the ginseng chicken soup and extra chilli for the kimchi soup). My number one favourite dish out of all that we had tried in this blog post, was the pumpkin spaghetti! 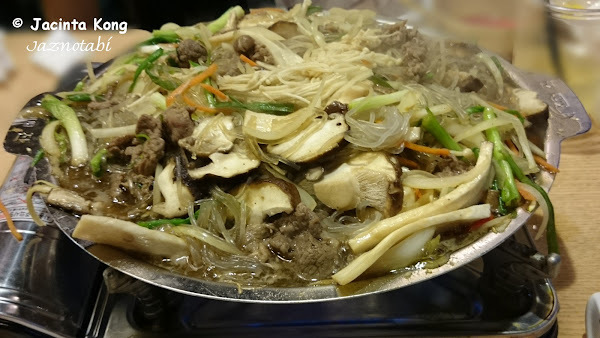 This was followed by the baked rice, hotpot and the kimchi pancake (LOL…I think some of my friends will faint if they hear that I’ve listed something containing kimchi as one of my favourite dishes since I don’t like kimchi!). 26 Sentosa Gateway, #01-30/31/32/33, Sentosa, Singapore 098138. Where exactly is it located within RWS? If you have entered Sentosa via the boardwalk, it’s right next to the Malaysian Food Street. However, if you are getting there from Waterfront station or the S.E.A. Aquarium, it’s located just beside Slappy Cakes. One of the latest eating establishments to open at Punggol Settlement, Horizon Bistronomy is a bistro concept that serves fine French delights in a casual setting. 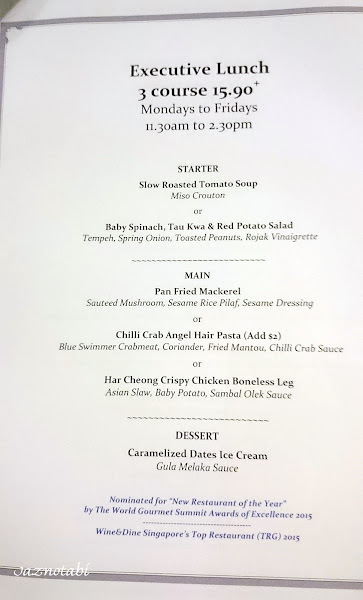 I was invited to a food tasting session last Sunday and was really surprised when I saw the address, as I never expected to find a French restaurant at the end of Punggol, which is well known for being a place to go to for seafood. This restaurant can seat about 40-50 people and both indoor and outdoor seating is available. Chef Chris Fong, the owner of the restaurant, started his culinary career as a line cook in the renowned Deliciae Hospitality group and has worked alongside 3-star Michelin Chef Bruno Menard and also Executive Chef, Damien Le Bihan from Restaurant Guy Savoy, Paris. This culinary journey then led him to various reputable restaurants like The Exchange at Asian Square and Salt Grill & Sky Bar. He also participated in the World Gourmet Summit and emerged as one of the top 5 finalists. Finally, he helmed his first brigade at Anthesis at Robertson Quay before leaving to start Horizon. Having a meal at this northeastern end of Singapore means you can dine with a view of the sea. 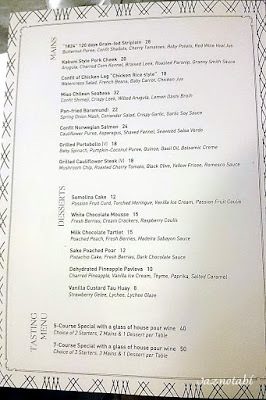 Their clipboard menu features a variety of dishes and also contains a list of alcoholic beverages. I believe the menu will continue to evolve over time cos at the end of our meal, the chefs actually surprised us with a new dessert creation which wasn’t listed on the menu yet – you can read more about this further below. We were first served with their homemade bread and I found the buns to be warm and fluffy with a milky fragrance. They were really good and I especially liked the one with the dried fruit! I’m not usually a bread person but I must say that I think I can sit here and eat several of these at one go, plus they are sooo fragrant that you don’t need to eat them with any condiments. The ingredients were fresh and I liked the chunky bits of crab meat that surprisingly tasted good with the chorizo oil. It was a well balance of interesting flavours which did not overpower the delicate taste of the truffle pasta. I don’t like most cheeses so I wasn’t sure if I would like this dish and thus did not order it, but a fellow blogger kindly shared some with me. The tomatoes were very fresh, juicy and appetising, plus the white lumps of burrata cheese were springy, a little chewy and had a light flavour, which complemented the dish well. As for the sauce, I couldn’t quite make out all the flavours apart from the pesto but there was definitely lots of olive oil in there! A delightful well marinated and almost melt-in-your-mouth pork belly, which was really yummy and the Kurobuta pork tenderloin was cooked just right! That black stuff which you can see in the photo was the grape mustard, which enhanced the flavour of the pork. We couldn’t tell that the mushy stuff beneath was roasted cauliflower puree as it tasted more like a sweet potato or pumpkin mash, but it was good! Being one of those people who absolutely love to tick off the ingredients listed against a particular dish on the menu if they are stated there, I was disappointed that I couldn’t find any trace of black pepper – I wasn’t the only one cos 3 other persons at my table agreed that they couldn’t taste any black pepper. Don’t be mistaken by my last comment – this dish was good just as it was, but it’s just that if the ingredients are listed against the dish on the menu, people expect to find those ingredients in the dish, so we were wondering if we were missing out on a different dimension of flavours – i.e. as to how the chefs expect the actual dish to taste. Oooh…the salmon skin was really crispy and the fish was beautifully cooked! I liked the slightly charred flavour of the prawn and the accompanying sauce reminded me of a prawn bisque. Hmm…perhaps they can take this sauce and make this into a soup? I would definitely order it. This was probably my first time having bacon as part of a dessert!! It was a little chewy and surprisingly it paired very well with the vanilla ice cream! The poached fig was a big plump morsel of sweetness and this dessert was truly an enjoyable medley of flavours! Our last dish was a surprise addition and Chef Louis Tan told us it was his latest dessert creation, which he named “Garden By The Bay”. We were all wondering what it was and kept peering over at the counter and our eyes widened when we saw what appeared to be the chefs filling some pots with brown soil!! Gosh…this looked like a potful of damp soil with some sprouts growing out of it! I was a bit hesitant about eating the “plants” as I wondered if their taste would be too “green” for my liking – if you eat them on its own, it does have a raw flavour with a slightly bitter aftertaste but if you combine these greens in the same mouthful with the other ingredients in this dessert, the flavours seem to blend well and the taste of the “plant” is masked by the sweetness of the fruit and creamy mousse. I thought the coarse dark chocolate soil was a little salty but overall it was an interesting dessert and definitely a conversation piece! Dining at this restaurant is a visual feast as the dishes are beautifully plated (well, apart from the tomato salad) and the flavours do not disappoint! The prices here are quite reasonable for the quality of food being served. Definitely worth a second visit! !